Thank you, Circe. Welcome to the neighborhood. I had the California BLT– layers of bacon, juicy red tomatoes, spicy mayonnaise, buttery toasted bread, fresh avocado and lettuce. 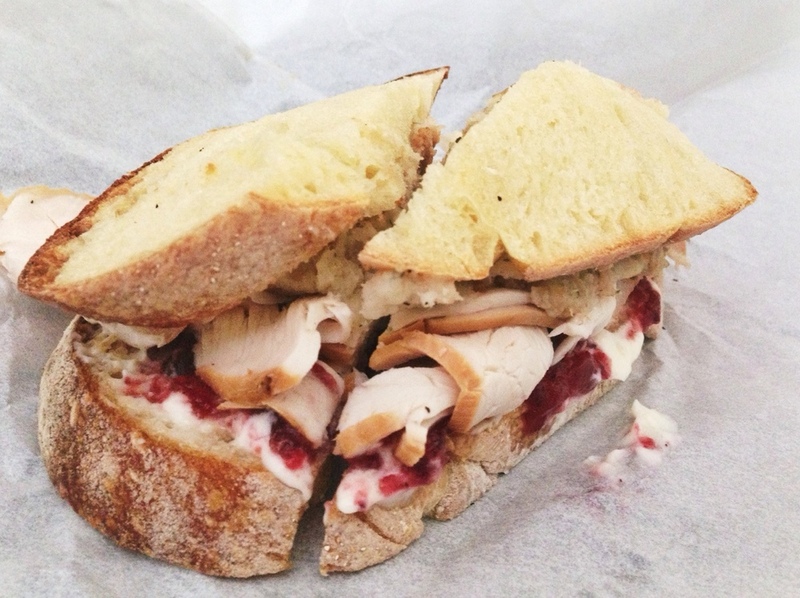 Alex had the turkey sandwich with moist stuffing, cranberry jelly, and whipped spread. We couldn’t be happier to have a new restaurant on Wentworth. After Andolini’s closed, YoBo disappeared, and Chicken Salad Chicks failed to open, anything on our corner is a blessing. Luckily, Circe’s Grotto is delicious! We went on their opening day and couldn’t tell! The service was great and the sandwiches were gourmet while still having that market fresh, homemade feel. The space is a bit short in seating so we opted to take our sandwiches to go. Circe’s Grotto has plenty of light and the clean industrial decor matched the new grey cost of paint on the exterior perfectly. We will definitely be back. With huge sandwiches at a great price, it’s worth checking out for yourself.